Outside Haggis Hostels we were drawn by the sound of a band around the corner to the Voodoo Rooms. This amazing building retains plenty of its’ former grandeur in lovely stained glass and elaborate moulded ceilings and walls. Past the doormen, we climbed the stairs to sample a cocktail looking out at a mass of cherry blossom, listened to music in a room which later turned out to be hosting a private party (Oops!) Spoilt for choice, we moved to an adjacent room where the second band of the evening was as entertaining as the people watching, where impressive retro outfits predominated (in fact coming from rural Derbyshire we were unsure whether they dressed like this all the time…) then before we left we opened another door just a crack to view the ballroom with its Cuban dancers. A memorable end to the evening! When we arrived at the Scottish Outdoor Pursuits Show to set up the Independent Hostels Stand, it appeared that the mountain bikers were going to do their tricks perilously close to our stand!-however by the next morning the barriers had been moved. In fact the crowds who came to watch this impressive team were to our benefit as we were able to make use of the waves of people gathering and leaving to promote the competition and give away copies the guide to hostels. There was a range of stands, with plenty to try, including a climbing wall and surfing simulator. 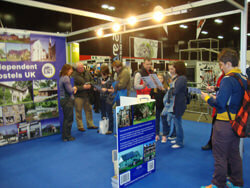 Thank you Scotland for making us welcome and supporting our Independent Hostels stand. We had memorable chats to seasoned hostellers, young people keen to try the hostels out, and families hoping to win a stay. We told them all about our great maps showing the locations of hostels and bunkhouses in:- The Scottish borders, Southern highlands, Edinburgh and Glasgow, The Trossacks, Loch Lomand and Lochaber , Mull, Arran and Argyll , Cairngorms, Moray and Abderdeenshire , Loch Ness, Fort William and Inverness , North East Highlands , Skye, Hebrides and West Coast of Scotland , Orkney, Shetland and Scottish North Coast. 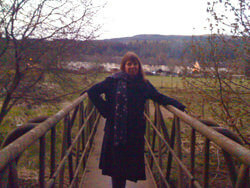 Byrness Youth Hostel, Forest View Walkers Inn and Spruce Cottage. A two hour scenic drive brought us to Forest View Walkers Inn, one of the remote Hostels, just off the main road in Byrness, a hamlet built for forestry employees. The plan was to plant conifers, then after 20 years to fell half the trees, a labour intensive method, hence the housing. However, the shallow rooted trees remaining after the first felling were then prone to wind damage, and the plan abandoned, giving way to cutting whole areas by machine. Fortunately the hamlet remains, without its school and post office. The Inn was in the YHA for a number of years operating as Byrness Youth Hostel. 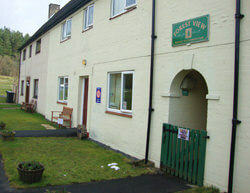 Forest View operated as an independent hostels for a few years and now it offers more B&B style accommodation. The owners of Forest View still provide for the budget walker on the Pennine Way with the provision of Spruce Cottage bunkhouse in another house in the hamlet. Bunkhouse guests get to use all the facilities at Forest View with a lower overnight price. SPRUCE COTTAGE BUNKHOUSE, as well as being a very well kept Bunkhouse with comfortable rooms (ours had twin beds), is close to Forrest View Inn which provides tasty evening meals and breakfasts, a bar well-stocked with local beers, and transport to the Pennine Way for walkers. Sitting in the cosy bar before the wood burner, we were regaled by the Pennine Way walkers with tales of mystery disappearances whilst we told them all about the great hostels we have visited. Here is a map showing the location of all our hostels and bunkhouses in Northumberland and here is an article about the Independent Hostels on the Pennine Way.